Should you make a purchase, you will get the same great price, and I may make a small commission. I use affiliate links to offset the cost of maintaining this site while bringing original recipes and travel tips to you at no charge. Thank you for your support of my site! I’ve been having so much travel fun this summer and of course, it has included some seriously tasty meals. 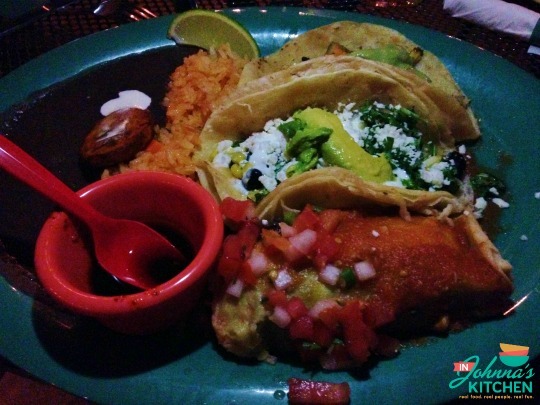 I’m excited to share with you not just one but two meals I had at BelAir Cantina in Wauwatosa, Wisconsin. I’m asked often how I find all of these incredible food spots on my travels. I do a lot of my own research, but most often rely on trusted recommendations from fellow food writers. 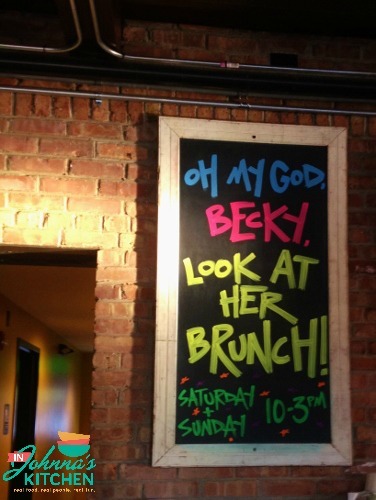 BelAir Cantina was recommended by Sarah of Celiac in the City. If she recommends it, I trust it, end of story. And it turns out on this trip, I was staying just a couple miles down the very street where this restaurant is located. Sarah pointed me in the right direction! So about eating here twice…that rarely happens when I travel. Usually I have a long list of places I want to visit and don’t make it to all of them, let alone visit one place twice. On this trip, I was traveling with a large group of mixed eaters, some gluten-free, some vegetarian, a kiddo, some full-on carnivores. BelAir Cantina was a good fit for all of us! On the first night, I dined with my favorite fella and my friend Eileen. So there’s me, gluten-free, my favorite fella who is vegetarian and Eileen who is an adventurous eater. We started off with drinks. 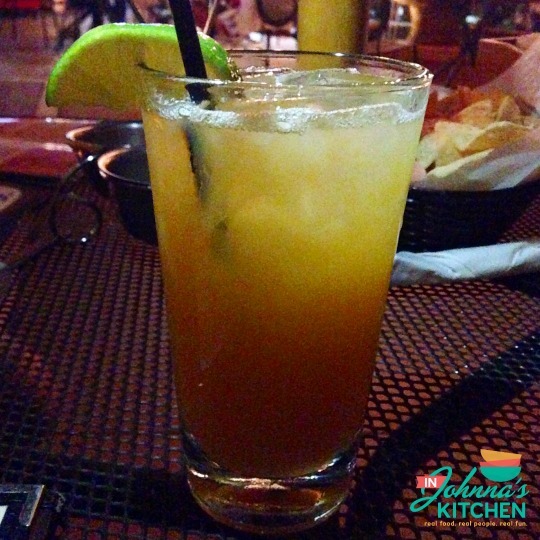 Eileen and I both had the cantaloupe margarita, made with fresh juiced cantaloupes. 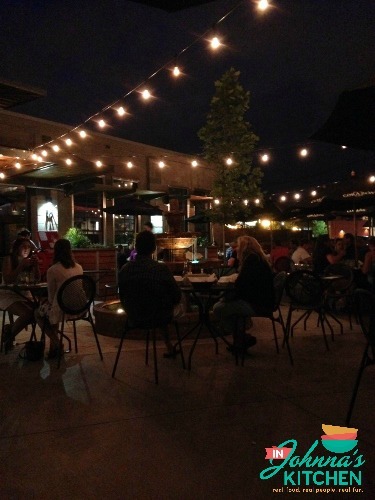 It was absolutely perfect for a warm evening on the patio. A few cleverly worded signs inside made me giggle. in fact, many things here made me smile, including the Learn to Speak Spanish tutorials playing in the bathroom. But what really worked for me was the outdoor space. They have an enormous patio area with lights overhead. Beautiful! And it was accurate! On the first evening, I was handed a gluten-free menu separate from this that outlined the offerings, which for me was almost overwhelming. I’m used to having one veggie taco option and hoping that it is also gluten-free. Here, there were many options! On the second evening, there was a different gluten-free list handed to me that was hard to decipher, but I had photographed the first night’s list and had it in my phone so just referred to it and confirmed multiple times with the server and asked that the kitchen be informed I’m not gluten-free by choice, to please pay a bit of special attention to my order. I had two meals with no issues! The first night I had two tacos and a tamale. 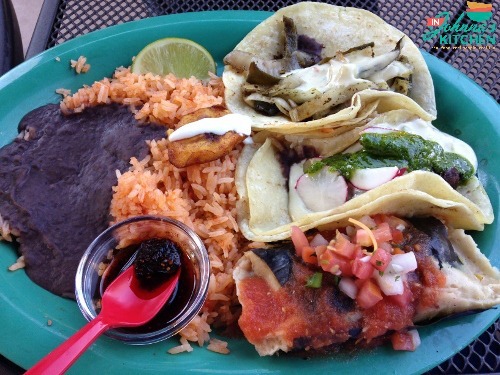 Tacos and tamales are ala carte on the menu, however if you order three, beans and rice are complimentary. I had the Black Bean and Corn taco which had sweet, grilled corn and avocados. I immediately wish I had ordered nothing but this style of taco, it was that good. I also had the roasted veggie taco, which included roasted potatoes. I love potatoes in a taco. And to round it out, I had the veggie tamale. I’m a wee bit picky about tamales and these most definitely passed the test. The black beans were sort of a paste, the rice was good. But you should really go here for the tacos. On my next visit, I was with a large group. The staff quickly assembled a group of tables and to my knowledge, there were no service issues even with the size of our group. I had tacos and a tamale again, this time trying the Port-Queso taco, which was packed full of sauteed mushrooms and radishes. So good! Everything I ate here was truly tasty. I would be a regular here if I lived in the Milwaukee area! I mentioned dining with some folks who have no dietary restrictions. If that applies to you or folks you may dine with, my dinner mates have recommendations to share: the Ninja Pig taco and the Fried Avocado Bacon taco. Neither are gluten-free or plant-based but I wanted to share because I know many of you dine out with mixed groups like I do! Eat With: Moderate Caution. I had two meals here with no issues with gluten. I did receive two separate gluten-free menu lists as I mentioned above, one easy to navigate and the other not consistent with the first. Both times, servers were knowledgeable and able to verify with the kitchen that my order was gluten-free. It is a large restaurant and can be a tad noisy, so make sure your needs are clearly communicated and verified when you order and when you take delivery of your order. BelAir Cantina is located at 6817 North Avenue, Wauwatosa, Wisconsin. 414.988.8533. We parked on the street on a weeknight and a holiday evening with no problem. 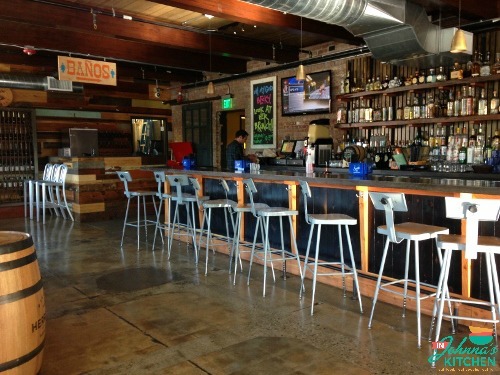 There is a second location of BelAir Cantina in Milwaukee’s Riverwest district. We drove past on our way to Lakefront Brewery. 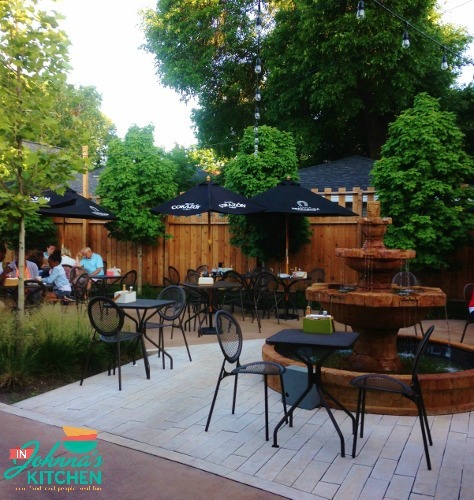 It looks every bit as fun as the Wauwatosa location and has outdoor seating, too. Johnna’s I Ate Here series is not intended as a restaurant review, rather a summary of Johnna’s experience dining out. You may or may not have a similar experience. Menu prices, items and ingredients featured were current at the time of writing. Please read the menu carefully and ask your server for assistance in ordering if you have dietary restrictions. 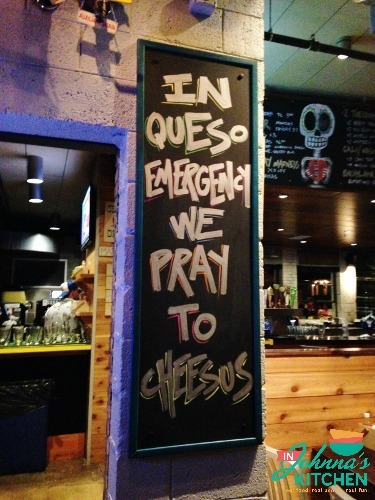 It’s a good idea to contact and let the restaurant know of your food needs. If you are eating gluten-free or specific allergen-free, Johnna suggests informing the restaurant staff of this, so they know this isn’t a food choice, but a necessity, and consumption will result in illness.